"What the king conquered, the prince shaped, the field marshal defended, was rescued and united by the soldier"
In the initial course meeting, after reviewing the syllabus and presenting an overview of the course, I collected a list of what we associate with the Holocaust. The answers ranged from specific people, places, events and groups (Hitler, Auschwitz, Crystal Night, Nazis) to more general concepts (mass killing, genocide, Nazism, antisemitism), to emotional and moral terms (mysterious, responsibility, bystander). 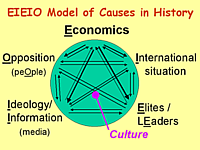 At the end of class I introduced my "EIEIO" model of causes in history. In short, I argued that the causes of any historical event can be categorized as follows: Economic factors (for simple societies, this is the Environment) are usually the primary movers (this is the basic postulate of Marxist historiography). International factors, the role of Elite groups and particular LEaders, the prevalance of certain Ideological world-views and the availablity of (true or false) Information, and the choices made by individual peOple (especially when in Opposition to economic motivators, elite guidance, ideological spin, or international pressures), all combine to yield a particular historical outcome. The precise way these factors combine is shaped by the arena of Culture, which determines how each factor interacts with the others. How did Hitler become an evil dictator? This question can be broken into two parts: How did Hitler become evil, and how did he become a dictator? (I'll deal with the first one now.) The deeper issue underlying this question is: What was Hitler's role in causing the Holocaust? Was he economically motivated, an opportunist who went into politics because he needed to make a living? Did the international political situation, the international pressures on Germany, and its international reputation, play a definitive role in his career path? Did Hitler have certain political role models, or powerholders who took him on as a protegé? Did he do what he did because he was imbued with nationalist, racist or antisemitic ideology? Did Hitler's popular acclaim among the German people egg him on to become what he did? Was there some peculiar, pathological psychic cause that compelled him to make his life choices? The actual lecture topic began with a discussion of primary sources--how can and do we know anything about Hitler? Where does our information come from (part 1)? I then offered an overview of Hitler's early life, attempting to answer the question: Did Hitler's family background predispose him to become a successful politicial and/or a Jew-hater (part 2)? Finally, I argued for the centrality of the Great War (later called World War I) and especially its aftermath in shaping Hitler's worldview and political career (part 3). This section began with an analysis of document 2 in the textbook (Engel 2000, 89f): Hitler's August 13, 1920 speech "about the Jews." I read the excerpt aloud in class and pointed out how historians interpret this passage to mean that Hitler, from this early date, wanted to murder all Jews (Engel, 15). I then produced a thick collection of documents, Hitler's Complete Writings, 1905-1924, edited by Jäckel and Kuhn (Stuttgart, 1980), which reproduces the entire 3-hour speech on pp. 184-204. It contains valuable additional information that enables us to better assess this document. A poster announcing this meeting of the NSDAP on a Friday night in the Hofbräuhaus in Munich titled the speech "Why are we antisemites?" We have the handwritten text of the speech (with a few minor edits in Hitler's hand), as well as a police report and several newspaper reports, including the anti-Nazi Munich Post and the Nazi paper Völkischer Beobachter (National Observer). There is no doubt that this is a murderously antisemitic harangue. At the same time Hitler's calls for death as the solution of the presumed threat posed by Jews are embedded in a detailed explanation of a racial worldview that addresses and attempts to refute many pro-Jewish standpoints. It is not a simple matter to connect this racist vision put forth by a minor figure in a provincial capital with a grandiose continental plan for genocide implemented with the resources of a major industrial nation. This is not Hitler's first documented theoretical statement about Jews. In September 1919 his Reichswehr boss asked him to answer a letter from a certain Adolf Gemlich asking why "Jewishdom" posed such a danger (see Jäckel and Kuhn, 88-90; translation on H-German). At that time Hitler's supervisor already knew that Hitler was a passionate "expert" on the "Jewish question." So, what are the sources that document Hitler's early life? Hitler's 4th grade class in Leonding, 1899 (AH top center): Predestined to lead? Hitler's own autobiography, Mein Kampf (My Struggle), written in 1924, supplemented by stories he told to his inner circle in the 1940s that were recorded by a stenographer and published after the war (variously known as Hitler's "Table Talk" or "Secret Conversations." We know that Hitler deliberately distorted and misdated some events in order to present to his followers a straighter line of predestination to lead Germany. The full text in English of Mein Kampf is available on the web. Chapters 1, 2, 4, 5, 7, 8 are the most relevant autobiographical ones. August "Gustl" Kubizek, his best friend in Linz and Vienna (fall 1905-fall 1908), who wrote his reminiscences for the NSDAP archive in 1938. He published a book in English in 1954 (republished in 1973): Young Hitler: The Story of Our Friendship translated by E.V. Enderson, introduction by Hugh Trevor-Roper (London: Allan Wingate, 1954). Although Kubizek boosted his memory by plagiarizing from Mein Kampf, he does add valuable insights. Reinhold Hanisch, who lived and worked with Hitler in the homeless dormitory in Vienna around 1910, and Karl Honisch, another resident of the dormitory who knew Hitler in 1913. 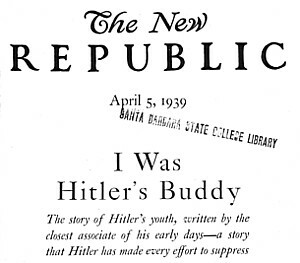 Hanisch published his story in 1939 in the New Republic under the title "I Was Hitler's Buddy" (scans and text available here); Honisch wrote his for the NSDAP archive in the 1930s. The memoirs of Hitler's fellow messengers in World War I, for example: Balthasar Brandmayr, Meldegänger Hitler 1914-18 (Munich, 1933), and Ernst "Schmiedl" Schmidt. Official documents about Hitler's life, such as birth certificates, police apartment registry entries, draft board proceedings, bank records, military regimental assignment and pay records, police reports, court records. Personal documents, including letters Hitler wrote to friends and acquaintences, photographs, drawings and paintings. Feb. 5, 1915: 12 page letter to Ernst Hepp in Munich, who had bought several of Hitler's paintings and knew him personally. Portions of the letter to Hepp were reprinted in Nazi newspapers between 1937 and 1945.
reprinted in Jäckel and Kuhn 1980, 64-69. Public media, such as newspaper reports, photographs and even films. Biographies of Hitler, especially those written during his lifetime, by journalists and scholars who, in addition to using the documents above, interviewed people who know Hitler. John Toland (1976): journalist interviewed more than 160 people in 1963 and 1970s. 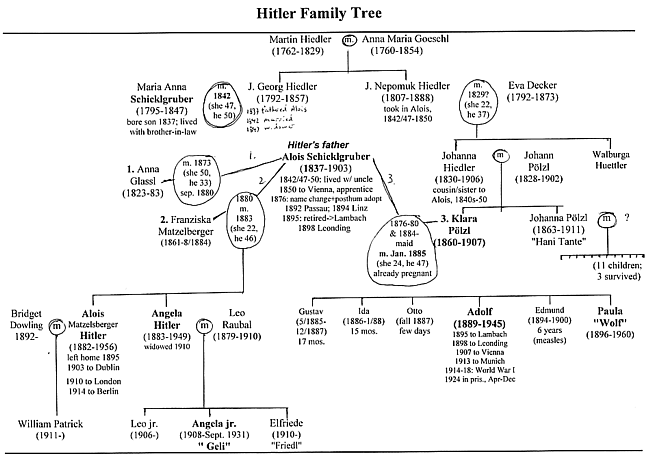 On Hitler's early life I discussed Hitler's family tree (below), an annotated scan from Ian Kershaw's 1998 biography (Hitler 1889-1936: Hubris, p. 4). Some of the important issues were whether Adolf's paternal grandfather might have been Jewish (almost certainly not), and the role the death in infancy of his mother's three firstborn children may have played in her relationship to Adolf. 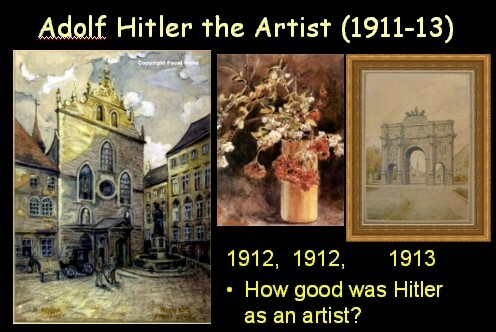 The main biographical dates are presented in detail on the timeline of my Portrayals of Hitler website. 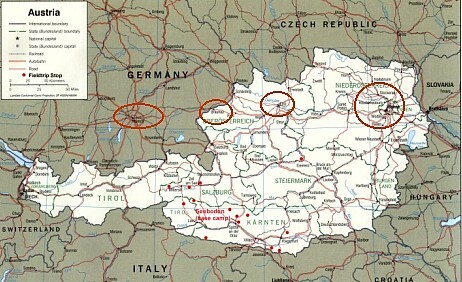 ancestral village in the Waldviertel region into an artillery range, wiping it out. What, if anything, does that say about his relationship to his family heritage? In this time of bitter wrestling between educating my soul and cold rationality, the Vienna streets did me an invaluable service by giving me a concrete lesson. The day arrived when I wasn't wandering the streets of the mighty city overwhelmed anymore, and I took in not only the buildings but also the people. Once while I was walking through the city I suddenly encountered an appearance in a long black robe [caftan] with black curls. relationship with his father: stern (Mein Kampf), or abusive (sister Paula; Table Talk)? note: NONE of the members of the Academy of Fine Arts examination board were Jewish (according to Brigitte Hamann, Hitler’s Vienna: A Dictator’s Apprenticeship, p. 53, cited by Kershaw, Hubris, 611n150. How good an artist was he? Why did he win the second one (in August 1917)? Nazi schoolbooks told (false) story of his singlehanded capture of 14 French soldiers. Was Vienna in 1907-8 (as Hitler argues in Mein Kampf), or Munich in 1919 the crucial turning point in Hitler's life? John Lukacs, The Hitler of History (New York, 1997), devotes chapter 2 (pp. 52-75) to this question. May: Kaiser-loyalist "white" free corps troops conquer Munich, "bathe streets in blood"
In May 1919 Hitler works for the reactionary "white" troops interviewing soldiers who had remained in Munich to find out how much they had sympathized with the "reds." We have lots of sources about Hitler's life. We must be careful not to take his own statements (or those of others who adored or hated him) at face value, but must carefully compare them to determine what may be true or not. 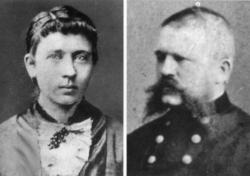 Hitler's family background and personal experiences prior to World War I were unusual. Although they certainly played a role in his later decisions, none of them were outright causal or determinate. Hitler's particular talents, ideas and character, in the volatile political situation in Munich in 1919, combined to set him on a path into radical German-nationalist politics. He was also a populist (seeking the support of "common people"), if not to say socialist (advocating working people's issues), and an antisemite. Antisemitism offered him solace and an explanation for the fruitless mass death of Germans he had experienced in World War I.
Hitler's Economic need motived him to try to stay in the Reichswehr after Nov. 1919, doing whatever he could to get by. The International situation of Germany's "humiliation" of defeat and the Versailles treaty stoked Hitler's German nationalism. Elites such as antisemitic Vienna mayor Karl Lueger in the 1900s, and the Reichswehr officers who supported Hitler in the summer of 1919, played an important role in shaping Hitler's later ideas and setting out his career in politics. The Ideology of antisemitism was present in his youth in Linz, young adulthood in Vienna, and very virulently in post-WWI Munich, where Jews were prominent in the leadership of the "reds" who failed miserably after a brief, hopeful start. The peOple who flocked to Hitler's speeches in the early 1920s certainly encouraged him that he was on the right track. Opposition--Did Hitler have any personal convictions that led him to decide against any of the above factors? No. If we ask: Did Hitler produce the Germany he wanted, or did "Germany" produce the Hitler it wanted, I would answer: From 1919 to the mid-1920s Germany made Hitler; in the late 1920s Hitler began remaking Germany. World War I messengers Ernst Schmiedl and Adolf Hitler, ca. 1917. Were they sexual partners? A recent book by German scholar Lothar Machtan, The Hidden Hitler (2001), makes a compelling case that Hitler had many intimate male partners until the late 1920s and even into the 1930s. Machtan's evidence is primarily circumstantial, but he shows that there was a concerted effort in the 1920s to destroy all evidence of Hitler's homosexual relationships. However, a large number of more or less direct references and allusions have been preserved. Does this "explain" any of Hitler's later behavior? Not really. Perhaps his own efforts to conceal and deny his homosexual inclinations made him particularly hateful towards open homosexuals, but certainly not all closeted homosexuals go on to preside over continent-wide mass murder. 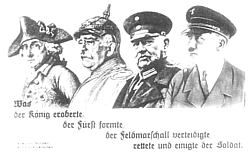 Hitler saw himself as continuing a long tradition of great German leaders, as the image at right shows. It was on a souvenir postcard distributed at the September 1933 Nazi Party congress in Nuremberg. It shows, Mt. Rushmore-style, Frederick the Great (1712-1786), Bismarck (1815-1898), Hindenburg (1847–1934), and Hitler (1889-1945). The caption reads: "What the king conquered, the prince shaped and the field marshal defended, was rescued and united by the soldier." We will return to these questions multiple times over the course of the quarter. Timothy W. Ryback, "Hitler's Forgotten Library," The Atlantic Monthly, May 2003, pp.